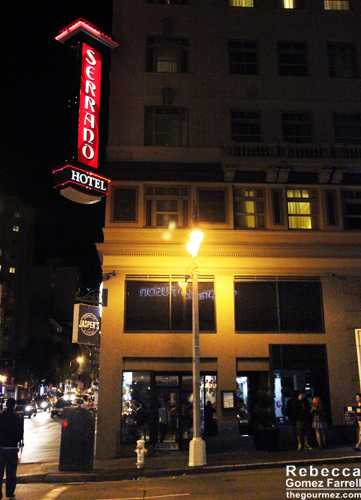 Jasper’s Corner Tap and Kitchen is an appealing Tenderloin escape from the crowds near Union Square in downtown San Francisco, especially if you’re in a drinking mood. The walls are a sleek gray with the occasional geometric patterns and letters embellished on them in shades of blue. Booths and tables are done in dark woods and black. Service is relaxed, and the extensive cocktail and beer lists with seasonal specialties should please most imbibers like myself. The menu is the everpresent mix of snacks, small plates, and large plates I’ve seen in pretty much every San Francisco restaurant I’ve tried so far. That’s not a complaint — just a statement of fact. This one has a bent toward New American and comfort foods. Friend #1, my husband, and I quickly made our drink selections. Rather, they made their drink selections while I took forever to decide on the Smashing Pumpkin. 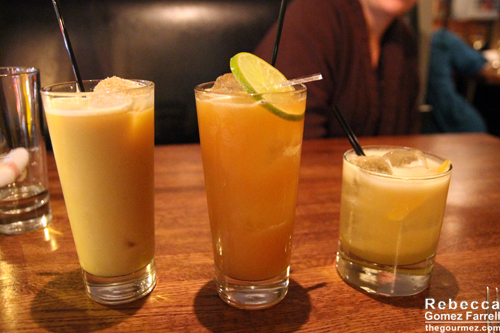 Smashing Pumpkin on the left, Friend #1’s drink in the middle, and my husband’s Wiessen Sour on the right. The Smashing Pumpkin was a heavy drink with a light texture from velvety egg foam. Maple pumpkin butter gave it depth and richness, but you could probably have two without feeling like you swam through calories. Dark rum, amaro, and sherry made for a creative combination of liqueurs with the amaro injecting smooth herbal notes into the mix. I would drink more. I would drink often. My husband enjoyed two Wiessen Sours made with Wild Turkey 81 bourbon, lemon, orange marmalade, orange bitters, and white beer. Friend #1 dubbed her twice-ordered drink “Delish!” though I can’t recall its name. Oops! 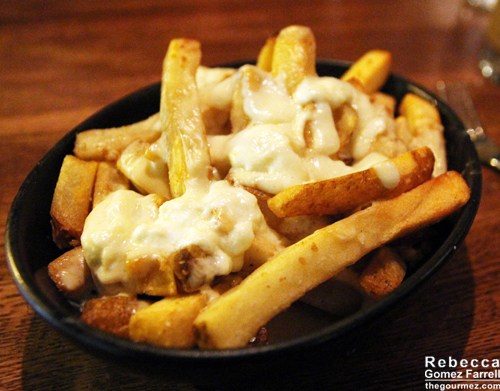 We lost the battle to resist the fry menu, opting to split thick fries with garlic and a smoky cheese fondue. You can pick thin, thick, or sweet potato fries and a variety of seasonings and toppings, which makes for a fun negotiation among dining companions. At $9 overall, it might be a bit pricey for fries, and better to eat with a fork than your fingers. But gooey cheese is always good, even if it felt like an unnecessary indulgence when the rest of Jasper’s Kitchen’s menu waited. 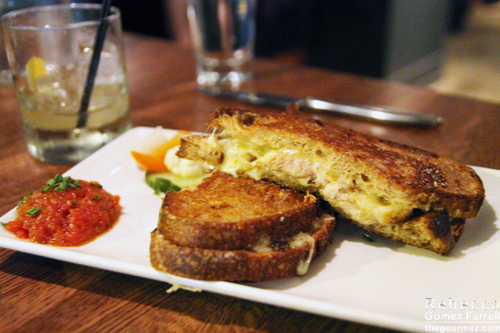 My dining companions continued the cheese celebration, both ordering grilled cheese sandwiches for their main course. My husband opted to add pork belly to his. Apparently, I opted not to focus well. He and Friend #1 were equally happy with their sandwiches, and Friend #1 described her cup of tomato soup as “Totes delish!” Whatever the picture you’re developing of Friend #1’s personality, you’re probably right. They both gave Jasper’s bonus points for offering that classic sandwich. I opted for lighter fare after those fries, choosing a double trio of deviled eggs: two green goddesses, two pickled devils, and two salmon asparaguses. Each egg was absolutely delicious, though the white of the pickled devil was on the rubbery side. But the tiny slices of habanero and bell peppers on top packed just enough punch to make up for that slight transgression. I think the vivacious, herb-packed flavor and lush creaminess of the green goddess egg made it my favorite, but the smoked salmon egg had a delightful balance of smokiness and vinegar acidity. 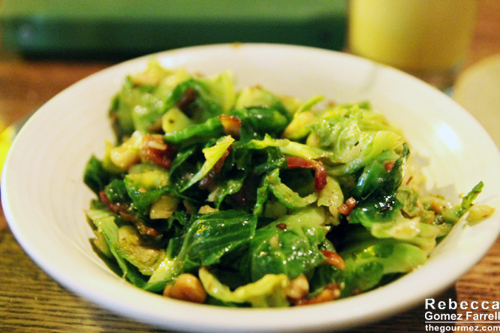 In addition to the eggs, I ordered a side of brussel sprouts with bacon and hazelnuts. Now I was aiming for light, but this was definitely laden with oil — delicious, delicious oil. I savored every bite of that dish. Highly recommended for brussel sprouts fans as it exhibited a wonderful combination of crunch and softness. 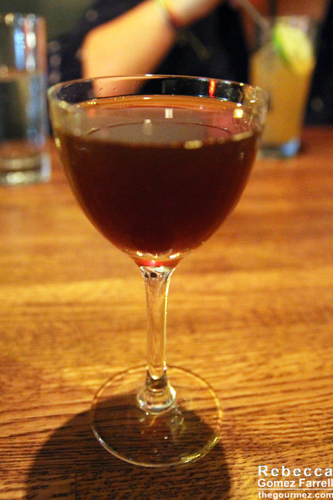 My meal ended with one last drink — the Age of Exploration with Broadbent madeira, cardamaro, Gosling’s rum, Angostura’s bitters, and Rocky’s bitters. The spices of the cardamaro were mellowed by both its cardoon flavor and the madeira’s smoothness, creating a drink a tad livelier than mulled wine. It tickled my tongue and made me long for the perfection of the cardamom-infused 2 Gingers Whiskey at the Local in Minneapolis. Anything that reminds me of that spirit is a good, good thing. In case you can’t tell, I will definitely visit Jasper’s again. I recommend bypassing the fry menu to save every ounce of appetite you can for the rest of the options. Want comfort food? They’ve got it. 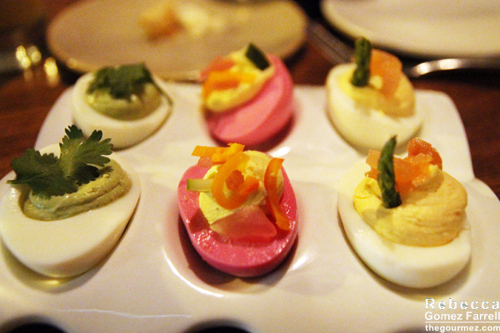 Want high-brow deviled eggs? They’ve got it. Want a full meal of coffee-brined pork with veggie ragout on one plate? They’ve got that too. I look forward to trying more from all their menus.